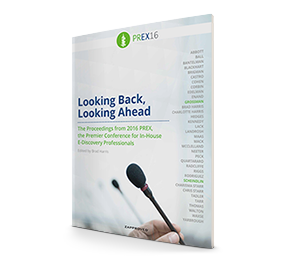 2016 PREX, The Premier Conference for In-House Ediscovery Professionals featured a fireside chat between attorney and professor, Maura Grossman and the Hon. Shira Scheindlin. Judge Scheindlin discussed topics ranging from her retirement, to her groundbreaking Zubulake opinions, to her thoughts on the recent amendments to the Federal Rules of Civil Procedure. She also reflected on some of the highlights of her career and expectations for the future of ediscovery.